This cottage, voted No. 1 cool cottage of Hampshire by The Guardian is located in a breathtaking setting and surrounded by rolling countryside. The Stables offer a 5 star private and peaceful retreat on the most southerly point of West Meon. 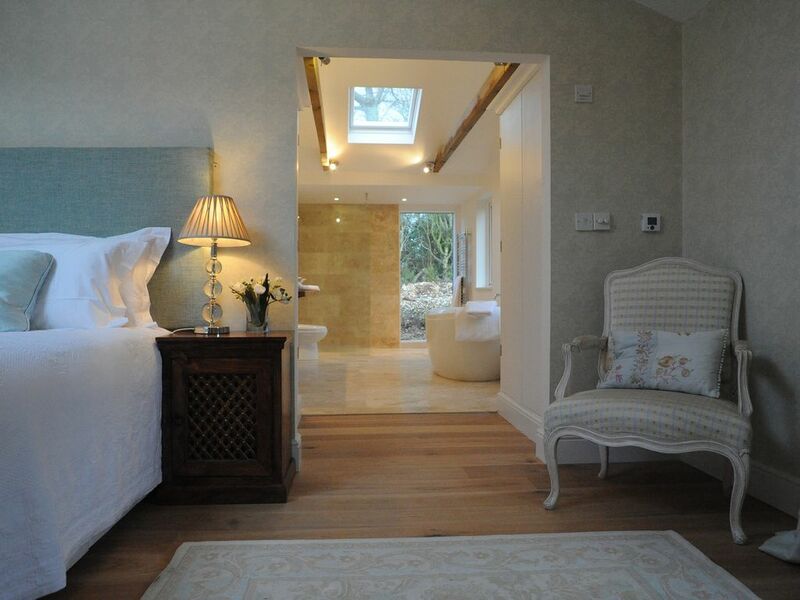 This elegantly refurbished cottage with (shared) pool has its own private access and garden. It is ideally suited for all kinds of activities because of its location. 20 Mins from coast, 20 mins to Winchester, 10 mins to nearest railway, Southampton airport 30 mins away. Country pursuits on the doorstep include fabulous walks, as we are in a National Park, fishing, riding, cycling and golfing, whilst National Trust Houses and historic towns, such as Winchester, are under 30 mins. There are number of good pubs in the area and many fine dining restaurants too. The pool is beautifully heated and has a Roman end with steps for lazy afternoons and reading. It is our intention to make this a really special visit. I love living in Hampshire because of its peace and tranquility and have also enjoyed working in the city 12 years before starting a family. Now that the children are at university, I have set up a small business in property development and planning consultancy and enjoy designing buildings and their interiors. My husband and I have traveled a little and have stayed in some guests houses, some of which have been just fabulous. My aim is to create a special experience for my guests and offer a unique opportunity to enjoy our gorgeous countryside and stunning views in a luxurious style and comfort where they feel genuinely pampered. Having enjoyed London and all it offers, it seemed fitting to move to the country when we had small children. The house we chose is in a fine location, set up high on the hills where glorious views can be enjoyed. The Stables are part of our property and has its own private drive and access, private garden and terrace and is in more elevated position than the house which makes it such a perfect retreat. We invite our guest to make use of the pool which is only yards away and is a floral delight. Converting The Stables, at the end of 2012, has been a fabulous project and real chance to create something unique and cutting edge. Light and space were most important. Here, enjoy the peace and tranquillity with shops, post office, butcher and gastro pub just 5 mins walk away. This state of the art bathroom,finished end 2012, has underfloor heating, two large basins, a walk-in shower, a double ended bath, WC, and 4 windows! This too has a vaulted ceiling with oak beams. Perfect for a romantic couple or those in wheelchairs. This is brought in for the hot summer months and other wise a fan is also available. Fresh cotton bed linen is provided. For those staying for more than one week changeovers/ new linen usually on Fridays or to suit guests. Only really enough to store bikes. There is a sofa, armchair, coffee, broadband,TV with SKY TV and Freeview & DVD, Desk, lamps, oak flooring with rugs, a large folding door 4.2 meters which allow guests to enjoy the stunning views. There are sheep in our fields. There is a new dishwasher. No one wants to work when they are on holiday! We have an under counter fridge. There is a fan assisted oven with ceramic hob. This was new in 2013. This brand new and spacious fitted kitchen enjoys spectacular views and has oven, grill, coffee machine, toaster, dishwasher, washer/dryer, fridge/freezer, kettle, microwave, and oak dining table. There are double doors leading onto a sunny patio. We have an oak table which looks out onto fabulous views. About 100 videos with usually all the latest ones available. There is a very large garden about half an acre. There is a lovely private terrace for you to relax in at the rear of the property where you can enjoy the views across the South Downs National Park. There are about 10 golf courses all within about 30 mins, 3 only just 5 mins away. This cottage has been designed around those in wheelchairs and has wide doorways and a wet room. All on one level. There is very large parking area and parking can be made within 2 meters of the front door. A portable ramp is available on request. Access to the patio is around the cottage on a gentle slope. The swimming pool has a Roman end with large easy steps for ease of entry and the access from the cottage to the pool is all on the same level. The pool usually opens around May and is closed around mid September. This is a very private area for our guests and is not over looked. the views from here are lovely. Notes on accommodation: The accommodation is all on one level so is suitable for wheelchairs. The property was completely rebuilt in Autumn 2012 and therefore benefits from fresh decoration, good insulation and brand new kitchen and bathroom. Outside: Private access and garden which includes two aspects. First is an acre garden facing south/east and the other is over far reaching views south/west. In the garden are table and chairs, hammock. The heated pool is shared with the owner. The parking, originally a stable yard, is spacious and makes for easy turning. There are several trees to find shade under. Utility Room: The utility is part of the kitchen please refer to kitchen. We also have a slow cooker and food processor. Cleaning / Towels / Linen / Maid service: Fresh white linen and fluffy towels, dressing gowns, pool towels and a cream tea are included. Friday is change over day, with arrivals invited for 3.00pm and departures requested for 10.00am. Evening meals can be arranged for late arrivals (no cost) Other: We have a characterful entrance hall with beautiful slate tiles. We never tire of visiting The Stables. We have stayed five times in different seasons and each holiday has been wonderful. The joy is, one almost welcomes bad weather because it's a good excuse to stay in and enjoy the luxurious surroundings, hidden treats and wonderful views. Vanessa is an amazing host who provides perfect facilities, is attentive and welcoming but never intrusive. The Stables sets the benchmark for our self catering destinations but so far we've not found one that comes anywhere near this. Our next stay is already booked! The Stables is in a class of its own. I am truly blessed with this couple and this gorgeous review. I am so grateful and am delighted that you love Stables and am so glad you're coming back again. thank you! Such a jewel that, selfishly, i would love to keep to myself. A lovely property to slow down in luxurious surroundings and watch the world scurry by. Wonderful touches by the owners to make the experience so special and personal. Thank you for taking the time to write such a pleasing review. It means a great deal to me! We'd be thrilled to see you at The Stables again, perhaps in the summer months, to experience the pool and the beautiful gardens with its flowers. It's been a joy having you both to stay and I was most touched by the note and gift you left for me. Thank you! The property is maintained to an extremely high standard. Attention to detail is outstanding. We have stayed at ‘The Stables’ twice now and look forward to returning again as soon as we can. The accommodation is beautifully furnished, equipped with everything you could possibly want and with some lovely extra touches. Both times we have left feeling relaxed and recharged and wishing we had booked for longer! The owner’s attention to detail is second to none. I'm always delighted to hear that guests have enjoyed their stay and it's especially rewarding when guests like yourselves have been referred to by family and friends. Thank you for this. It's a great compliment that guests like to The Stables come during the winter months and we try and make it a warm and cozy place to escape to. Thank you for all your kindness. From booking to leaving, Vanessa and Mark have been incredibley nice and communication from Vanessa was amazing with everything explained and sorted for myself and my girlfriends long weekend stay.. The minute we arrived we were blown away with the lovely welcome note and treats laid out for us. We were given a warm welcome from Vanessa along with warm freshly baked cakes and a cream tea, milk butter and eggs were also freshly supplied. The lodge is warm and very comfortable, and finished to a very high standard. We were amazed at the quantity of supplies provided, the owners have thought of everything. We will definitely return. Thank you so much for your kind review. I'm delighted you liked the tea and would like to return. That's a lovely compliment for us which means a great deal. We had a very restful week in this lovely property, with all the comforts of home and a cosy peaceful setting. The Witterings are our local sandy beaches which are approx 35 mins away.